I apologize for taking so long to send these to you. It has been a little hectic wrapping up my time in Italy. I don’t want it to end! Hopefully one day I will be back, and I would love to stay in contact with you! 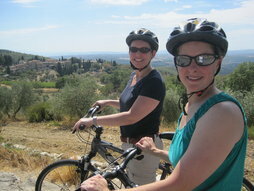 Attached to this email you will find some of the pictures from our ride to Siena last week. Thank you for such a wonderful day! 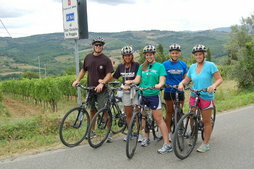 We had a great time on the bike ride from Florence to Siena. Thank you for making it possible! The weather was perfect and the scenery fabulous. 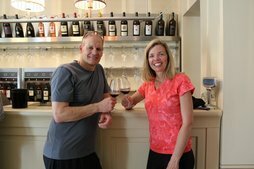 It was a treat to experience the winery - especially insightful with your expertise. Chianti Classico has new meaning to us after this trip! We thought we would share a few of the photos from the trip. Thank you again for a great day and your suggestions. We had great food eating at "Il Fagioli",,,so, you earned our trust :-) Of course we said that you sent us. We'll be in touch! 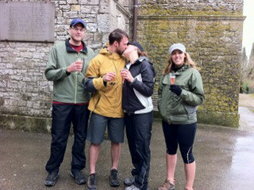 We toasted them with a chilled on ice Franciacorta rose. They loved it !!! 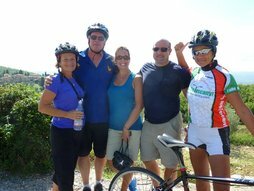 We had the pleasure of riding along with Marco while our daughter, her husband and our teenage grandkids did the Florence to Siena ride. Even just riding in the van (and being group photographers), we had a fantastic time! 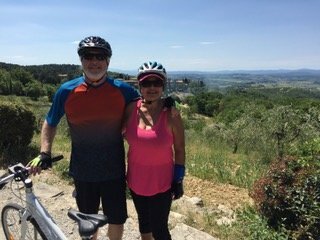 The scenery was just beautiful with the vineyards, rolling green hills and olive groves, and Marco definitely kept us entertained (being a native Florentine [he's called the 'Super Tuscan! '], he is, of course, extremely knowledgeable about the area). 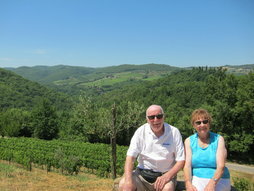 We stopped at a wonderful winery for a tasting along the way and a truly unforgettable lunch in a lovely village. Oh, and Siena was great, too! Don't miss it! If we had this much fun just "along for the ride," you can imagine how those actually on the bikes felt. They loved every minute and we all agree it was the best day of our family vacation in Italy.